Sometimes you may need information about a computer system, for instance to troubleshoot a issue or to look up the exact type of hardware of the PC system. Sys Information is a free and handy tool that can do that, and some more. It is not as sophisticated as previously reviewed applications Speccy, PC Wizard or System Information for Windows. The program uses tabs and a small sidebar menu to display information on multiple pages. 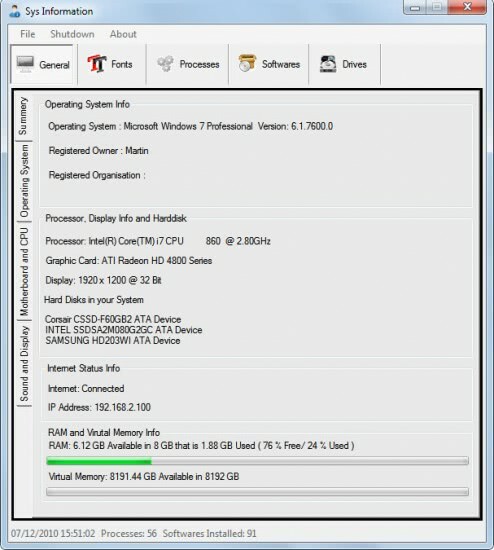 The general tab at the top lists the computer's hardware and related information. Its sidebar menu divides the information into a summary page, operating system, motherboard and cpu, and sound and display. Each page lists various information about the computer's hardware or software. The summary page for instance lists information about the operating system, processor, hard drives, graphics card, IP address and RAM usage. The general tab reveals all relevant information about the system. Some system information tools go into more details but in most cases those are not needed by the majority of users. The other four available tabs lists the system fonts, processes, software programs and drives. There is no interaction possible there, for instance to kill a process or uninstall a font. The only other available feature is the ability to create a report which creates a rich test file with the most important information. It is unfortunately not possible to customize the report, for instance to include other information displayed in the application. Sys Information, the Windows System Information Tool is available for download at the developer website. The program is fully compatible with 32-bit and 64-bit editions of the Windows operating system. thanks martin, so you bought an extra ssd, are the corsair any better?